80 degree temperatures are on the way, including to the Oregon Coast! Hard to believe after seeing snow down below 3,000′ this weekend, but it’s coming. Models have been telling us this for almost a week; so quite a good forecast. Gusty east wind tomorrow through Thursday morning in and near the Gorge. Gusts could exceed 50 mph tomorrow night and Wednesday. Take a look at the 500mb (~18,000′) chart for Thursday morning; that’s quite a ridge of high pressure centered right on the West Coast! We haven’t seen that this spring so far. That blocks all storminess and when it’s in this position we get surface high pressure to our east. Thus the breezy east wind expected the next few days. And when the ridge is very “sharp-looking” like this one, we tend to get a nice sharp trough of low pressure down at sea level along or off the coastline. That’s why in this case the east wind will make it all the way to the beaches. How warm (hot) is it going to get? Models are in excellent agreement that 850mb temps (~4,000′) will be around +16 to +17 over Salem/Portland Wednesday and Thursday. When you combine that with maximum mixing of that air down to the surface due to the easterly wind, you get a high temperature of 85-90 degrees. 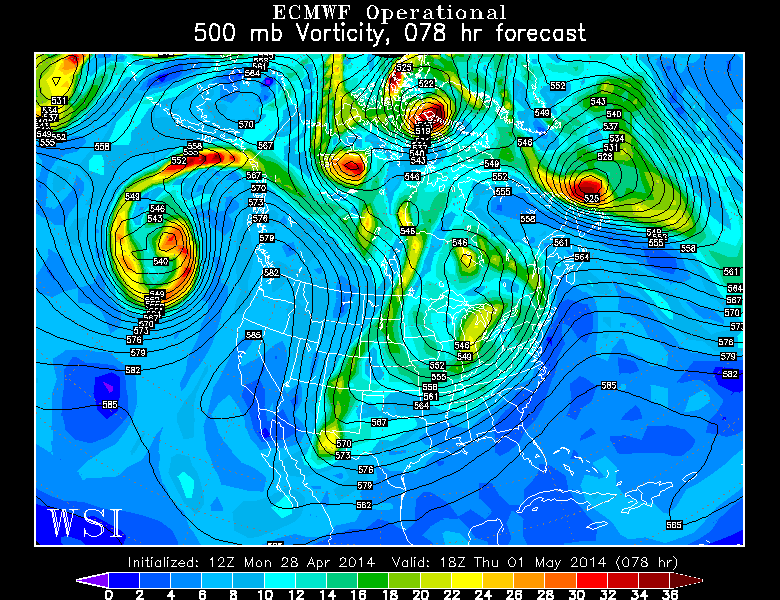 It is EXTREMELY rare to get 850mb temps above +16 in April. In fact from 1992-2009, that’s 500+ days, there have only been 3 days that warm. One that hit +17, and two that hit +18. They were 86, 86, and 90 degree days here in Portland. So will we break a record? 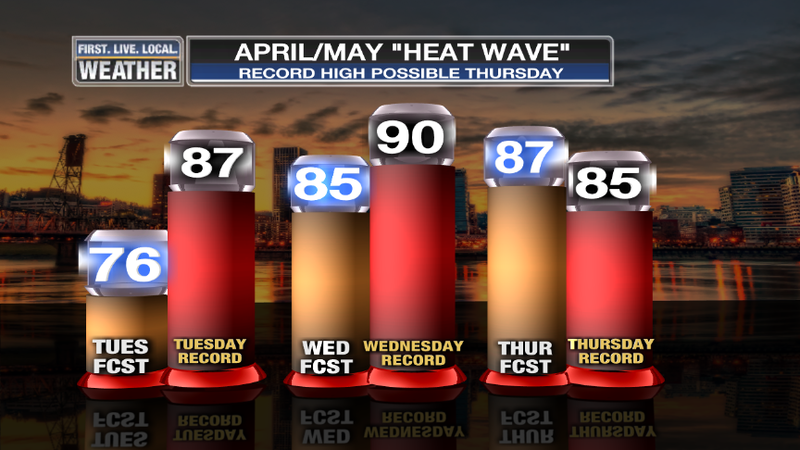 The red columns are the records at PDX for the next 3 days, with my forecast numbers in yellow. Wednesday is the day in 1998 when we hit 90 on the last day of the month, so no record coming that day. I have a feeling we may break a record on Thursday though. This entry was posted on Monday, April 28th, 2014 at 5:31 pm and is filed under Weather. You can follow any responses to this entry through the RSS 2.0 feed. Both comments and pings are currently closed. Sure is a great time to enjoy the weather. The air is heavy with spring blooms. The warm sun feels good on the skin and I like it. I can get behind some 75 and sunny days in April, but 70 at 8:00 am is disgusting. Can’t wait to get today and tomorrow out of the way. LMFAO!! “disgusting”……..way to over react, geez!! Seriously, it feels gross to me. I had the AC on in my car on the way to work. I just went out for a little break, and it actually feels pretty good out. Gesh. For air that only contains 20-25% humidity? My definition of disgusting includes areas east of the rockies, but not here. Sunshine and 64 to wake up to on the coast? ?? Sure! Still very nice here in Newport! Amazing mid 70’s day in most areas. This evening things decoupled and some areas cooled more quickly. For now it’s 70 here on the north side of town. I hope the beaches aren’t too crowded tomorrow. I’m counting on it being mid week to hold off the hoards. So,do you think the frost/freeze date is done for the yr or can we still have a frost in May? Thz. Last frost dates are in May for most of the lowlands, so it is still possible. That said, the odds are definitely against it. Quite the dramatic change up here (Bainbridge Island, WA). From frost yesterday morning to well into the 70s (summer temps for us) this afternoon. Maybe even warmer tomorrow. No, warmer is not a sure thing for us tomorrow, just a maybe thing. It all depends on the winds. There was very little sea breeze today, which is why it got as warm as it did. If the greater heating in most places tomorrow causes more sea breeze, we’ll stay cooler on the island even though areas away from the water are warmer. I’ve seen it happen before in warm spells. i remember living in Oak Harbor on Whidbey Island, and it would be close to 100 down here, and low 70’s there, and it would feel so warm id be in the front yard with a sprinkler drinkin beers. North Whidbey really gets blasted by the sea breeze coming in the Strait. Summer highs are often only in the low to mid 60s there. Bainbridge gets much less wind and is significantly warmer in the summer, but still typically about 5 degrees cooler than Seattle. I wonder if the “Looks more like September” thought crossed Mark’s mind this past day or two, with the warmest air centered west of the Cascades and a very strong east wind through the Gorge and over the Cascades? I believe this is the classic definition for a NW heatwave. While, there are different definitions for a heatwave, here at least, I think this one is the best fit. 3 or more days of 10 + degrees F above average temperatures. Our average high is around 65, and we’ll be well above that for 3-4 days. Also, on a tech note, 850 MB is actually ~5000′, 1500 meters or exactly 4921.26′. Sorry Mark, everyone makes misteaks…enjoy the heatwave! No we don’t want them to behave, it makes for a better newscast! You can be ‘anti-establishment’ and civil at the same time, y’all knowse…. This is great! We get some tropical weather without paying for the plane ride! UGH! 80’s in April? I’ll be inside waiting for it to pass. The NWS says the hottest day this week in Tacoma will be 80 before rain returns on late Friday. Tue-Wed; Columbia river here I come!! I can’t wait for this heat, it’s going to be awesome.